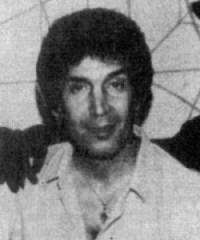 Photo of Don Newton which accompanied the story of his death in The Comics Journal #93, September 1984. Photo is courtesy of long-time inker and friend Dan Adkins. ho was Don Newton? Don was one of a number of comic book artists working in the 1970's and early 1980's. Don was one of my favorites and I was shocked in September of 1998 to go searching for Don on the internet only to find a fleeting reference here or there. I think that is criminal. Don was too good of an artist to be so quickly forgotten. That is why I have created this site, as a tribute to Don's work and the many, many hours of pleasure I have derived looking at it and studying it. Maybe Don is not well remembered because he never hooked his name to a "winning" strip (although he spent years drawing Batman) or maybe it is because his unique style was always being watered down by inkers who had no idea how to handle his pencils. I don't know why Don is not better remembered, I only know he was a great artist who died way too soon. When I started this site I didn't know a whole lot about Don, I mainly knew his work. However, I've been learning, thanks to a lot of great people who knew Don over the years and who have graciously shared that experience with me. I know that Don was born in the small coal mining town of St. Charles, Virginia and that at the age of four Don developed asthma. The family doctor advised the Newtons to move out west. The family traveled about for a time, living in New Mexico, Arizona, California and Colorado before finally settling down in Arizona. Don grew up and spent most of his life in the Phoenix/Scottsdale/Mesa Arizona area. I also know he first started out as a comic fan artist in the late 1960's and that he did a lot of work for G.B. Love and SFCA. I first met Don's work in the pages of G.B. 's Rocket's Blast & ComicCollector or the RBCC as everyone called it. It was love at first sight. Don Newton did not draw or paint like anyone else, his style was uniquely his own. He was fortunate enough that when he did go pro in the mid 70's that Charlton Comics was open to using paintings for their covers. This gave Don an outlet for this aspect of his talent that was not available previously and was not available in the years to follow. And folks, Don's paintings were too good not to be seen. I know that before his career in comics took off, Don was an elementary school Art teacher. In the December 1977 issue of the New Gods (#15), editor Paul Levitz explains the absence of Don's pencils from that issue by saying that Rich Buckler pitched in with pencils, "while English teacher Don Newton gives his final exams." Actually, Levitz was incorrect, Don was not an English teacher. In the very next issue Don is back penciling and in the letters page Levitz remarks that, "Don Newton is back with us this issue, and will be here ad infinitum--especially since Don has just given up his teaching post in Phoenix to devote full-time to comic art." "Don was an art teacher when he was a teacher, and often worked on his comics work while at lunch or while his students worked on other projects. One of the projects that Don had his students do was to draw a comic book page, which often produced interesting results, and I think he went so far as to print it for the class as well. He did a lot with storytelling and with perspective, and used a lot of classical Renaissance painters in his teaching. The funny thing about Levitz's statement above is that the delay that DC sited had nothing to do with Don, but more so to do with Gerry Conway being late with the script, and Don already having been assigned other work. As I remember, Conway had only sent Don half of the script, and when Don was ready to move onto more pages, DC had him do something else instead, and had Buckler finish the work out of New York, figuring that Don would be unable to receive the script, finish the pencils and send it all back in time. The reference to Don being an English teacher was DC's screw-up; Don was an art teacher, who did substitute early in his career as an English teacher, but he was an art teacher for a Junior High school in Phoenix Arizona. DC just didn't have a clue and wrote the wrong information." "My husband and I thru friends found this site and were touched. My name is Christy Newton; I am the wife of Don's son, Tony, who is currently residing in Scottsdale, Arizona for Dreamscapes Tattoo and Piercing. It's so true about Don's work and artistic ability showing thru in Tony..."
I would love to hear more from the Newtons and would love to showcase some of Tony's work on the site, illustrating the passing on of the talent to the next generation. If that never happens I would still like to thank Tony and his wife for the kind words. There was an odd paradox in Don's personality: Don was very set in his ways, very much a creature of strong habit, yet he would have these periods in his life where he would do something, something major, with great spontaneity, without thinking it clearly through and almost universally the results were disastrous. One example of this was Don's move to Reading, Pennsylvania. Don's friend and sometime inker, Dan Adkins, encouraged Don to move to Reading. Dan recently wrote, "I wanted Don to move east so that I would have an artist friend to go to New York with -- I usually delivered my jobs in person -- 3 hours from here to New York by bus, 3 more back of course. Steranko is here but he seldom went to New York, and he drives; I don't like riding in cars. Of course it would help Newton to get work. He liked to pencil, I liked to ink and we made a good team." Well, Dan did it, he talked Don into moving to Reading. Don did this by buying a house over the phone and moving immediately, for you see, Don had never been to Pennsylvania; he just took Dan's word for it that he would love it. But he didn't. Adkins remembers, "Newton hated it back here -- too many trees, curved roads, hills, no pools -- winter weather. He liked Phoenix. He bought a house in Reading, came to Reading, stayed two days. Sold the house and went back to Phoenix." Jay Willson remembers that a week after Don moved to Reading Jay went to dinner at a Mexican restaurant that had been Don's favorite. As Jay walks in he sees a man sitting at a booth with a menu in front of his face. Something about the guy seems familiar. The menu slowly pulls down and sitting there was Don. Another example of Don's disastrous spontaneity was his second marriage. It was shortly after his return from Pennsylvania and way out of character for Don. Don liked to "play the field." I also know that Don was very much appreciated by DC Comics. The tribute that DC paid Don upon his death was, at the time, unprecedented. Don was a really big Captain Marvel fan. He once ran an ad in the RBCC where he was willing to trade paintings for a Captain Marvel wristwatch and figurine. 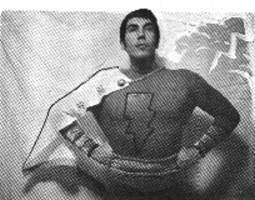 Don had a Captain Marvel costume and wore it to comic conventions in the early years (before he became a pro). You could say Don was a handsome guy and he was in good shape; he always fit the costume well. It seems Don was a health-nut, and worked years trying to develop the "perfect" body. You don't have to take my word for it, see for yourself. 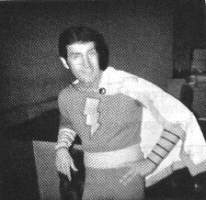 Don in his Captain Marvel costume at an early comic convention. Years later at DC Comics Don would get his chance to draw "the Big Red Cheese" in the pages of World's Finest Comics. I saw Don once, at the San Diego Comic Convention. I don't remember the year, though the convention was still being held at the El Cortez, so it was a while ago. Anyway, my partner Baron Mrkva and had just crossed the street from the hotel to the convention center and were making our way into the center when Don walked out (no, not in a Captain Marvel costume!). I didn't want to appear like a geeky fan, so I didn't go over and tell him how great I thought his art was. I regret being that worried about how I might look. Who doesn't want to hear that they are truly appreciated? Well, Don never heard it from me then, but if he's up there surfing the cosmic internet, he's hearing it now. Don in his Superman costume at the 1973 San Diego Comic Con. 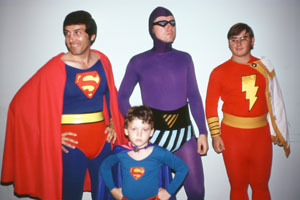 That is his son Tony in the other Superman costume, David Lee (as The Phantom) and Shane Shellenberger as Captain Marvel. This photo was taken by Mark Evanier and was published today on his excellent News From ME blog. It is kind'a cool that the two heroes Don is standing with are ones that he became famous for drawing. Donald L. Newton was born November 12, 1934. He became a professional comic book artist in 1974 and died on August 19, 1984 after suffering a massive heart attack a few days earlier. Don was 49. If Don is remembered for anything it is for his work on the Phantom at Charlton. It was spectacular, but it may explain why he is not that well known. Charlton Comics were never the darling of collectors, nor did they ever sell very well. The fact that what I think is Don's best work was done at Charlton and not DC or Marvel may be why so many seem to have forgotten him. Maybe they just never knew of him. "Don Newton was indeed the mainstay artist for many of the publications I did. And I never met a nicer person. He never asked for any payment for any work he did for me, though I would send him a few bucks when I could afford it...I guess I discovered Don. In the early sixties he wrote me a letter along with a couple of photos of his work. One was a color painting of Capt. Marvel and SHAZAM. I wrote him back asking if he would like to do some art for the RB&CC, and I mentioned the painting in the photo looked very nice. A couple of weeks later I received it in the mail as a gift (unfortunately I no longer have it)...I will say one thing. Don has much (if not more) to do with the success of the RBCC as anybody." In the September 1984 issue of The Comics Journal, Nicola Cuti remembers how Don got his start at Charlton. "Don sent in some Xeroxes of Captain America, I believe it was. I liked them immediately." Nick sent the work to Editor George Wildman and prodded him to give Don some work. In the same issue, artist Dan Adkins who inked Don's pencils at Charlton and DC talked about their work at Charlton, "We got the bottom rate," he said. "We got $25 per page, and we would split it down the middle. We each got $12.50 per page." Adkins added that Don got $70 for his cover paintings. So, I'm learning more about Don Newton, about who he was, but even before I started on this site I knew what he left us. If you look at the artwork here, maybe you can figure out some about who he was. Maybe you'll just see what I saw in his art; in an industry where everyone tried to draw like Neal Adams, Don Newton tried to draw like Don Newton. 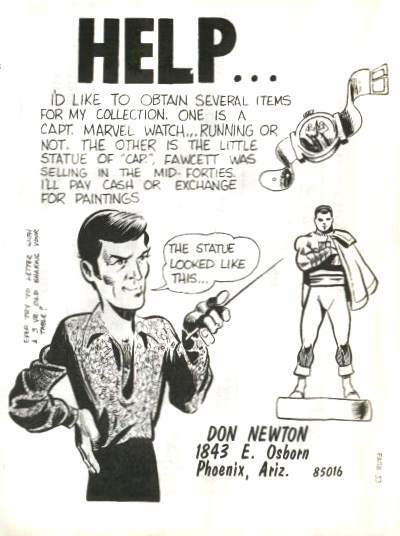 And if you are a fan of comic art, you could do a lot worse for yourself than collecting Don Newton's legacy. The books he did are relatively inexpensive and are a joy to look at, and I for one am very proud to own so many of them. Addendum: For me there has been an unexpected by-product of creating this site. I had to go back and look at over 15 years of Don Newton art, and I've noticed a few things. I had a major pre-conceived notion that could not survive in the bright light of truth created by the volumes of work Don did at DC. The notion that I have held for years that Don's best work was on the Phantom lasted about a week into creating this web-site. Simply put, Don's pencils on the Batman books are superior in every way to his pencils on the Phantom. His ability to tell a story just got better and better with each issue of Detective and Batman. Characterization had always been a strong point of Don's art, but the cast of supporting characters Don created in the Batman strips was truly remarkable. Don was replaced on Detective by Gene Colan, one of the top "realistic" artists in comics and one of my all-time favorites. But you know what? Don's Batman was better and Don's art was more realistic than Colan's. Compare the two artist's versions of the Joker in different issues of Detective. Even with a slick inker like Klaus Janson enhancing Colan's work, Gene's Joker is a caricature while Don's is a character, a person. Don never got too flamboyant, never strayed to far from reality and for a strip like Batman or the Phantom, that is just what was needed. My opinion is that Gene did go too far and it was not a appropriate for Batman as it was for the superb Tomb of Dracula, Dr. Strange, Daredevil, Captain Mar-Vell and even Captain America (word for you real comic art fans out there: beg, borrow or steal all of Gene Colan's Captain America issues. The strip was never done better!). Having said that then, the question that must next come to mind next is, why do we remember the Phantom and dismiss the Batman work? I can think of four reasons why. First, Don's work first came to light for most people with the Phantom. For example, I know that Walt Simonson worked on many strip for many years, but when I think of Walt, I think of his Manhunter strip in Detective. Not Walt's best work, but our first real glimpse of his talent and what first comes to my mind when I think of Walt. It is the same with Don and the Phantom. Second, the best inker of Don Newton was Don Newton and, with one exception, only at Charlton was he allowed to ink his own pencils. After Don himself, the best inker of Don's work was not, as Don thought, Joe Rubinstein, but rather Dan Adkins, because the detail work of Don's pencils remained on the page when Dan was finished inking. Third, Don's work on the Phantom interiors can never be separated from his cover paintings. We think of them as a set and Don's covers were just wonderful. Fourth, With the exception of Jim Aparo and his creator, Lee Falk, I challenge you to name one other artist who has drawn the Phantom. Most people can't (I know I can't). Now, how many Batman artists can you name? I can think of 15 without working up a sweat. OK, after working on this site for a couple of years now I can name a whole bunch of Phantom artists, but I still contend that most people can't. Finally, maybe I'm just the exception; maybe most people do remember Don for his almost six years on Batman, his three years on Captain Marvel in World's Finest and his work on Aquaman in Adventure, not for his work at Charlton. If you do remember Don, I'd be interested in hearing for which work you remember him. In the end I don't think it matters if it was his fan work, or his Charlton work, or his DC work (no one remembers his Marvel work), it only matters that you remember him. I think Don was one of the best comic artists there ever was and that's how I'm going to remember him.